(#1), Sean Lenning, (#1), Luis Cordova, (#3), Daniel Cordova, (#4), and Vic Perez (#7). Joining the R48 Elite 8 were rising R48 stars Max Max Langmack (#14), Dave Munson (#16), Tyler Stoffel (#21), Ryan Pesch(#26), and Sam Esser(#27), as well as collegiate and Midwest stars Michael Gaulton, Dane Szatkowski, Anthony Sullivan, Mike Munson, and Garrett Bacon. The women’s open singles field was also loaded with top talent, as 2018 Tucson Memorial WR48 finalist and WR48 #6 Ciana Ni Churraoin, Chicago legend Megan Dorneker, WR48 #8 Hilary Rushe, MO State standouts Mikaila Mitchell and Taylor Rumping, and 2018 Lake Forest College handball star Kyra Vidas were aiming for the Milwaukee Classic title. Co-R48 #1 Killian Carroll returned to the form that saw him win nine of 11 R48 stops from February of 2017 through May of 2018, dismissing former R48 pro Michael Gaulton, R48 #14 Max Langmack, and R48 #4 Danos Cordova with alarming ease en route to the final. “Flash” allowed just 36 points in six games en route to the final. “Killian played very well (against Danos),” stated WPH star reporter K3 Kyra Vidas. 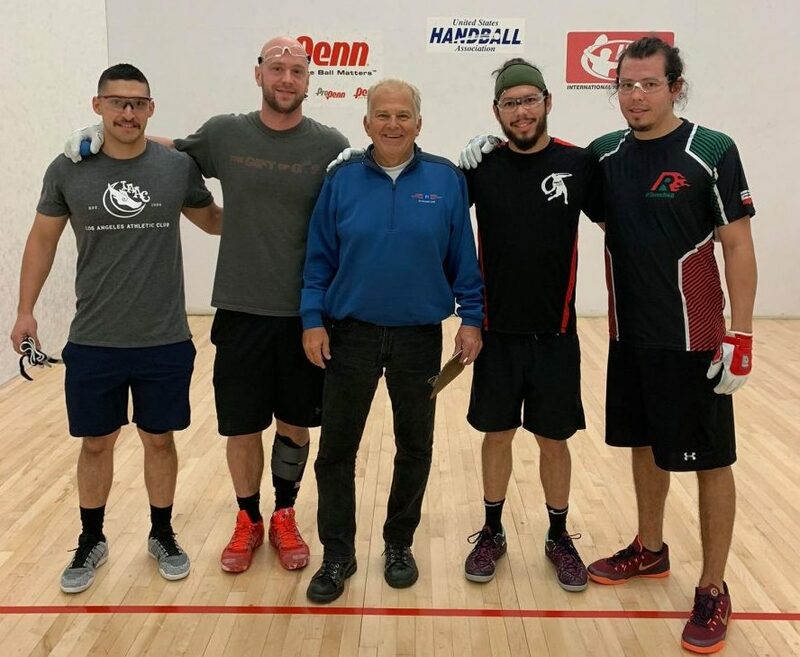 Lucho Cordova emerged from the bottom bracket, dismantling former junior national champion Anthony Sullivan in his opening round, serving a donut in the first game to Midwest star Mike Munson before dropping the second game and dominating the tiebreaker to advance to the semifinals, then overcoming co-R48 #1 Sean Lenning in the semifinals. In what is quickly becoming the most exciting rivalry in handball, Lucho and Lenning went toe-to-toe for nearly two hours. 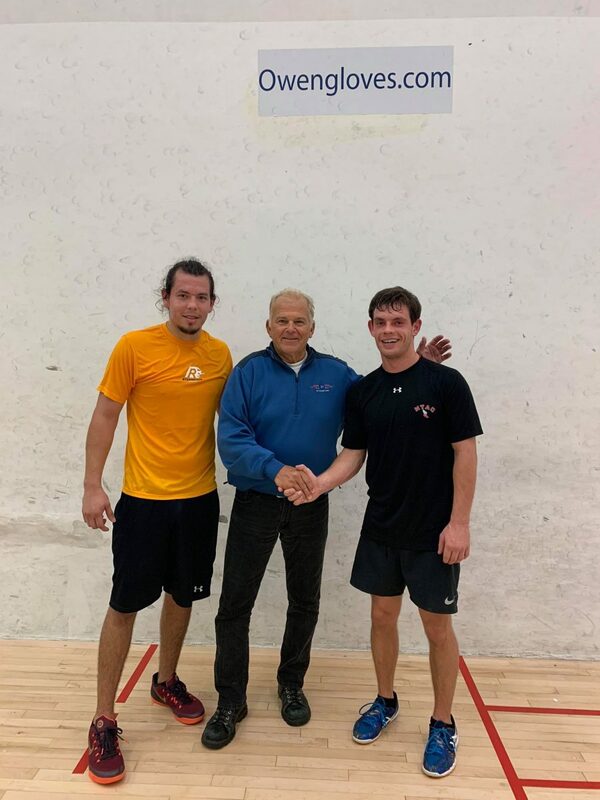 Lenning had defeated Lucho in three consecutive tiebreakers on the R48 tour dating back to Las Vegas in February, including a semifinal tiebreaker win four weeks ago in Tucson. Lucho ended Lenning’s third-game streak in Milwaukee, shifting the momentum from a second-game blowout loss to dictate play in the decider. “I love watching these guys play, what a match!” exclaimed K3. Carroll and Lucho had met once this season on the R48 tour entering the Milwaukee final, with Lucho notching his first win against the three-time defending R48 Player of the Year in a comprehensive two-game sweep on his home court in Atlanta in October en route to his first R48 title. Carroll started quickly in the final, exacting revenge on his R48 8 Atlanta conqueror by pressing the action and running away with the game. Lucho battled in game two, extending rallies by neutralizing Carroll’s power serve and executing his offense. The game was close throughout, but it was Carroll who executed his shots late in the game to win the title. Sean Lenning teamed with Vic Perez to win the doubles over Team Cordova, handing Lucho his second finals loss of the day. 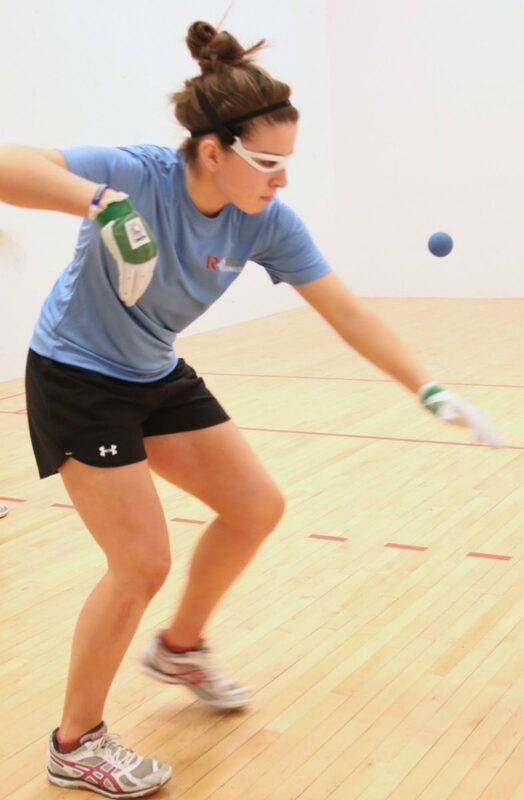 WR48 #8 and defending Milwaukee Classic champion Hilary Rushe played steady handball en route to the finals in her title defense, ousting Meghan Mudd and Mikaila Mitchell to advance to the final. Rushe was pushed by Mitchell in the first game of the semifinals, but erased any doubts in game two. “Hilary really stepped up her game in game two,” stated K3. WR48 #6 and the youngest finalist in Race 4 Eight history Ciana Ni Churraoin was making her first start in Milwaukee, quickly making her presence felt. 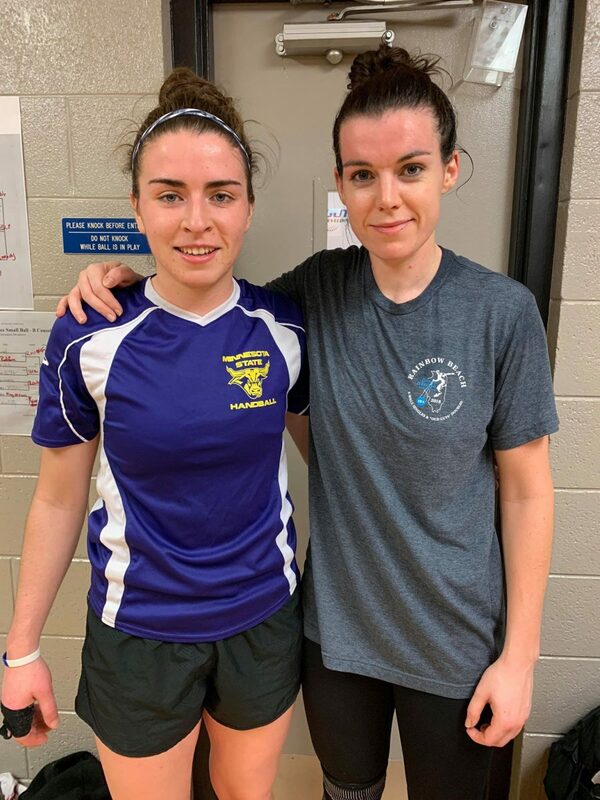 Ni Churraoin was the most dominant player in any bracket in her march to the final, allowing a combined five points in four games against collegiate stars Mary Troullier and Taylor Rumping. CNC continued her dominant form in the final, never allowing Rushe into the match and cruising to her first Milwaukee Classic title. In CNC’s three starts since tearing her ACL in the spring of 2017, CNC has finished third at the World Championships in August, second in the WR48 Tucson Memorial in November, and first at the Milwaukee Classic. With CNC now living in Minnesota for the next two years, the WR48 has another serious contender! WPH star reporter 3K Vidas captured the Women’s Open singles consolation. Thank you to 2018 WPH Rookie Reporter of the Year/WPH Rock Star Kyra “K3” Vidas for the updates from Milwaukee. Great work K3! Pictures from Milwaukee courtesy of K3.